Unless Disney World is under a hurricane watch or warning, chances are the rain you see will pass quickly. Some months are simply prone to afternoon thunderstorms; check our month-by-month guide to Disney to get an overview of the weather each month to see if your trip is during the rainy season. Don't let a few drops of rain spoil your Disney vacation; with a little planning, you can make the best of even a rainy day. Continue with your regular plans: Most Florida showers are just that — showers that are over in a short time. 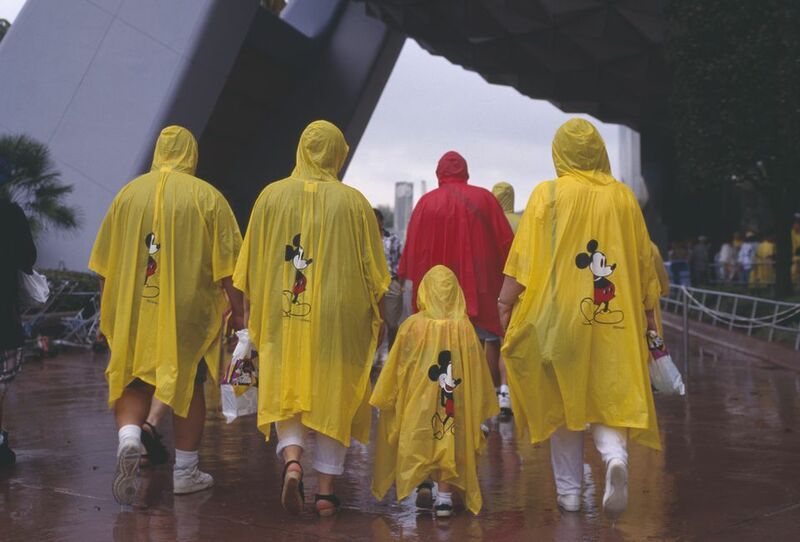 Pick up a poncho for each member of your family, and stay in the theme park you have chosen for the day. Indoor attractions will likely still be open, and if you see a long show like the American Adventure at Epcot or Mickey's Philharmagic in the Magic Kingdom, the rain may have passed by the time you exit the attraction. Explore your resort: Every Disney World resort has fun recreational offerings and things to see and do. Some deluxe resorts like the Animal Kingdom Lodge offer enough activities to keep you busy for an entire day. Check your resort activity schedules or ask an on-site cast member for ideas on what to do indoors. Hit the Magic Kingdom or Future World: Both the Magic Kingdom and the Future World section of Epcot are ideal for rainy days. The attractions in these locations are close together so a quick dash through the rain will bring you from one spot to another. Both locations are also home to plenty of indoor attractions, allowing you to stay out of the bad weather entirely. Avoid the Animal Kingdom and World Showcase during a rainstorm; both areas require lots of walking and have exposed, open pathways. Take a nap: Schedule some downtime at your resort when you see clouds looming on the horizon. Disney resort rooms are equipped with blackout curtains and temperature control, so heading back to the room for a nap will allow you to get some rest while everyone else fights through the rain. After the storm passes, you can head to the Extra Magic Hour park of the day for a late evening without getting overly tired. Plan to see a water park: It sounds crazy, but since Florida storms can be so short in duration, you can usually plan a day around them. If it is raining in the morning, head to Typhoon Lagoon or Blizzard Beach when the day clears up; you'll have a blast, and the park will be deserted, thanks to the early showers. Visit Disney Quest: Disney Quest is Disney World's indoor amusement park. Aimed at pleasing big kids and teens, this is a prime destination when the weather is bad. If you have purchased the Water Parks Fun and More Pass, your Disney Quest admission is included. Not a Disney Quest fan? Head to Disney Springs (formerly Downtown Disney) for a shopping expedition instead. Take a ride on the monorail: Use the rainy day as an opportunity to explore Disney's monorail resorts. You can go shopping in the Grand Floridian, grab a great lunch in the Polynesian, and hit the arcade at the Contemporary. When it stops raining, you'll be a monorail ride away from the Magic Kingdom and Epcot. Visit the spa: If you see rain in the forecast, consider booking a massage or spa treatment. You will need to book in advance, but plan a pampering session for the rainy period and you'll enjoy the spa, without feeling like you are missing out on the theme parks. Traveling with kids? Book some rainy daytime at the Pirate's League or Bibbidi Bobbidi Boutique instead. If the forecast calls for rain all day and you want to see some of Florida's other offerings, ​head to one of these area rainy day venues instead. Edited by Dawn Henthorn, Florida Travel Expert since June 2000.